For those of you who dread the end of ski season you’ve come to the right place. 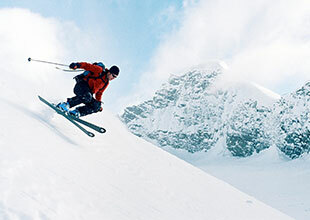 View and book one of our Alaska ski trips and mountaineering courses. Massive mountain ranges converge here to create some of the best and most remote ski and ski mountaineering terrain in the world. The best part is you can ski them all summer long…. 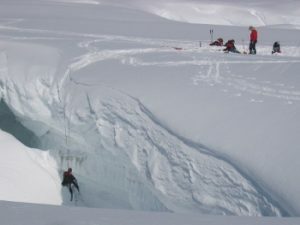 Since 1978 St. Elias Alpine Guides has used ski-equipped bush planes to explore and ski the remote mountains of the Alaska Range and Alaska’s Wrangell St. Elias National Park. 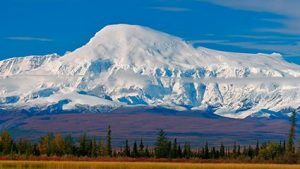 With terrain ranging from mellow touring to the big mountain lines Alaska is famous for we have something for you. 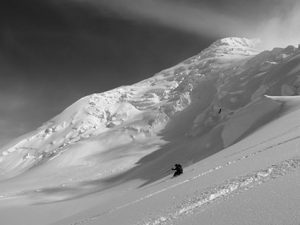 Sign up for one of our Alaska ski trips or ski mountaineering courses and let our expert ski guides take you on the ski trip of a lifetime. Contact us for more information, to to set up your Alaska ski trip! Carving turns on glaciers, rappelling into couloirs, skiing off of big summits – this is ski mountaineering, the art of turning mountaineering terrain into skiing terrain. Train with our experienced ski mountaineering guides to help build the skills and confidence to take your skiing to the next level. With the number of skiers and snowboarders venturing into the backcountry on the rise, first descents are increasingly rare. Join us on this trip of a lifetime, as we explore the unexplored on a quest to ski in places that have never before seen tracks.